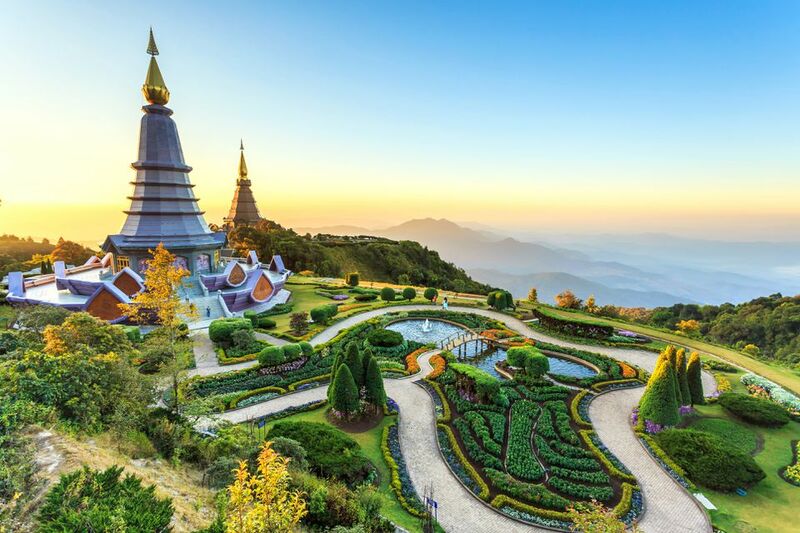 Chiang Mai is a popular launching point for trips into other parts of Northern Thailand, but the city is very much a destination in its own right. Two days in Chiang Mai will go quickly with so many interesting things to see and do! Chiang Mai's Old City — a perfect square enclosed by a medieval moat and crumbling brick wall — is filled with ancient temples, charming guest houses, and plenty of cafes serving coffee from the nearby hills. The labyrinth of narrow streets and lanes (soi) crisscrossing the Old City's interior has confused many a traveler. Fortunately, they are dotted with unique shops and cozy spaces. Chiang Mai is literally surrounded by tourist activities. Attractions include a zoo, night safari, zip lining, bungee jumping — the list is extensive. Operations collect tourists in the Old City, take them out for day trips, then return them in the evening sunburned and happy. Doi Inthanon National Park and Chiang Mai Canyon are also within day-trip striking distance of Chiang Mai. Although there are enough choices in the immediate area to keep you occupied for at least a week or more, most people will find that 48 hours in Chiang Mai's Old City area is enough to enjoy the best it has to offer. We'll focus our two-day itinerary on activities within or very near to the Old City. First things first. If your two days in Chiang Mai include a weekend, adjust your itinerary to go see the Saturday or Sunday "walking street" markets in the evening. They're a crowded-but-enjoyable Chiang Mai experience popular with locals and tourists alike. You can sample many kinds of food, shop, people watch and enjoy free entertainment. The Saturday market is slightly more popular with locals, perhaps because it isn't held at Tapae Gate, essentially the front door of the city. Fewer tourists accidentally walk up on the Saturday market than the Sunday version. You'll find the Saturday market on Wua Lai Road, just south of the Old City. Unlike the Saturday market, the Sunday version is held front and center at the main gate of the city. The market stretches down Ratchadamnoen Road, the primary road through the Old City. Scores of people accidentally "discover" the market, so it becomes very busy and disrupts traffic. Although crowded enough to induce claustrophobia during the high season, the Sunday market arguably hosts more options and has grown to stretch down adjacent streets. Both markets begin in the late afternoon and wrap up by 11 p.m. Arrive early if you're serious about eating and shopping — it will be hard to move around much later in the evening! Prices for locally made souvenirs and trinkets are competitive, and the shopping environment is fun. The two markets differ in feeling and setting. There's no reason not to go enjoy both! 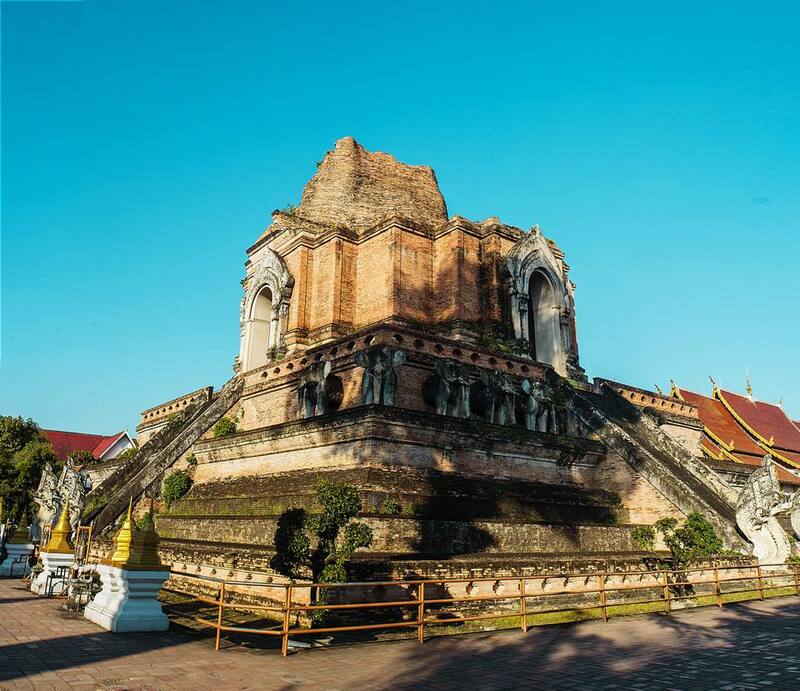 Morning: Plan to spend your first day in Chiang Mai getting your bearings and visiting some of the temples in the Old City. Grab a free map and begin walking. You can take tuk-tuks to farther points when you get tired (taxis aren't really a thing in Chiang Mai). Stop for frequent breaks at one of the many quaint cafes or healthy juice shops. There are four temples you shouldn’t miss: Wat Chedi Luang (right in the heart of the Old City), Wat Pan Tao (made of teak; very near Wat Chedi Luana), Wat Phra Singh (dates back to the 14th century), and Wat Chiang Man (13th century; elephant statues) — all are within walking distance in the Old City. While visiting temples, ask about attending a "monk chat." Participating temples around Chiang Mai will let you ask an English-speaking monk whatever you like. These daily events provide a unique opportunity to learn a little about how the monks live and think. Note: You should be dressed appropriately for interacting with the monks. Vegan/Vegetarian: Chiang Mai is home to a lot of vegetarian restaurants. Many run cooking schools. In the Old City, get over to Moon Muang Soi 6 for a handful of healthy choices. Taste From Heaven and Juicy 4u are two quality choices. The Bodhi Tree Cafe, located off the beaten path on Rachadamnoen Soi 5, serves healthy offerings in an open-air atmosphere. Khao Soi: You can't visit Chiang Mai without trying khao soi, the regional noodle curry with a sweet-and-spicy taste. Nearly every restaurant in town has it on the menu, but a few specialize in khao soi. For the "real deal," go to Khao Soi Khun Yai on the northern edge of the Old City. This is one of those no-frills, no-menu places that does one thing (khao soi) very well. They close at 2 p.m.
Other Northern Thai Food: Another popular option is Huen Phen on Ratchamanka Road in the middle of the Old City. Lunch is a better value and less crowded than dinner. The menu is ideal for sampling local Lanna specialties, especially the sausages and sticky rice (khao niaw). 2 p.m.: Time to escape the heat of the day and grab a massage. Chiang Mai is an oasis for inexpensive massage options, although more lavish spas can also be found. For a uniquely Chiang Mai experience and to support a good cause, you can opt for a massage at the Chiang Mai Women's Correctional Institution Vocational Training Center. The supervised inmates are taught massage as a job skill that will be valuable after their release. 3 p.m.: Feeling nice and relaxed, it's time to head to Warorot Market, the largest market in Chiang Mai. The multi-level indoor market is located a 15-minute walk east of the Old City, just before the Ping River. Walk out of the Old City at Tapae Gate, stop in briefly to see the quirky statues in front of Wat Mahawan on the right (think: Donald Duck), then take a left at the Tops Mini Market. Warorot Market sells supplies to local restaurants, but it won't be as busy in the afternoon. With a little negotiating, souvenirs will inevitably be cheaper than the next stop. 5 p.m.: Walk 10 minutes south (crossing back over the main road) to the Chiang Mai Night Market to grab an evening drink as you wait for vendors to get set up. They typically open around 6 p.m. The Night Bazaar lures in (and overcharges) tourists seven days a week. Don't expect to find many bargains on the cramped sidewalks — that's why you visit Warorot Market first — but numerous art shops and eating/drinking spaces make walking the strip an interesting diversion. Forego the Western chains (Hard Rock Cafe is one of many on the strip) and get ready for dinner in the Old City. Tip: Ignore all of those many fliers advertising Thai boxing at the stadium. Young men will have given you a handful by now. As you could already guess, it's pretty well a tourist trap. There are better ways to spend your time in Chiang Mai. 7 p.m.: After getting cleaned up, go for a nice dinner. The House by Ginger, although pricey by local standards, serves delicious food in a beautiful setting. Find the popular restaurant just north of Tapae Gate. You'll probably need reservations on weekends. If you prefer to make dinner a more inexpensive "local" experience, go enjoy the outdoor eating scene at Chiang Mai Gate in the southeastern part of the Old City. Numerous carts sell delicious local food cooked in front of you. They get set up in the evening just before sunset. 9 p.m.: Now's the time to take advantage of Chiang Mai's nightlife if you plan to do so. Most of the bars in the city observe a strict midnight closing time, although there are after-hours spots. For a serious party — and numerous live music choices — head over to Zoe in Yellow. The square at the corner of Ratchapakhinai Road and Ratvithi Road is home to small live-music venues that cover the spectrum of dance, reggae, ska, and even heavy metal. The 48 Garage car bar on the corner is a good option if the drunk backpackers around Zoe get to be too much. A more "sophisticated" option is to head over to North Gate Jazz Co-op at the north gate of the Old City. The popular hole-in-the-wall is a Chiang Mai institution. Jazz musicians (sometimes famous ones) jam as spectators sweat and sway in the cramped space (hours: 7 p.m. to midnight). Morning: Today you’ll head outside of the Old City to explore Doi Suthep, the 5,500-foot-tall mountain that’s home to one of the region’s most important temples, Wat Phra Tat Doi Suthep. Assuming you aren't visiting during the "burning season" when smoke obscures views, you'll be able to photograph Chiang Mai from above. 10 a.m.: Since you'll be on the western side of the Old City, begin the day by diverting to Wat Umong, Chiang Mai's "Tunnel Temple." The underground temple is unique, and the grounds are lovely. Even if you've seen your fill of temples, this one is different and worth exploring. The peaceful grounds are rarely busy. 11:30 a.m.: Before making the 40-minute trip up the mountain, you'll need to decide if you want a "real" lunch or don't mind just eating from some of the food/snack carts near the temple. Options on top are limited. If breakfast wasn't substantial, go 10 minutes north through Chiang Mai University to the Nimmanhemin Road area. Frequently shortened to "Nimman," this part of Chiang Mai is home to many tempting choices. Plan to also grab dinner in this area on your way back from Doi Suthep. Two Unique Lunch Options: Consider supporting the Free Bird Cafe, a charitable vegan restaurant that does great work for Burmese refugees. Find the artistic meetup space on Siri Mangkalajarn Soi 9 (about 10 minutes from Wat Umong). If they're too busy or hosting an event — they do both — go two streets over to the cheery Cafe De Nimman on Siri Mangkalajarn Soi 13. 1 p.m.: After lunch, head up Doi Suthep and enjoy the golden temple at the top. A small market, food stalls, and other facilities are available. You can ride the cable car (for a fee) or walk the many stairs to the top for a view. Take your time enjoying the most important temple in Chiang Mai. Doi Suthep is located about 45 minutes west of the Old City. Although you can easily get a tuk-tuk to take you there, go the local way by sharing a ride on one of the city’s many red pickup trucks (songthaews). Ask at the songthaew lot near the North Gate of the city; look for the Doi Suthep sign. You can also find songthaews bound for Doi Suthep on Huay Kaew Road near the Chiang Mai Zoo (40 baht per person). An adventurous option is to rent a scooter and drive yourself to Doi Suthep, but the road is very steep and winding — don't attempt it unless you consider yourself a proficient driver in Asia! 5 p.m.: Grab transportation back down the mountain (traffic will be busy around now) to the Nimman area. If you wish, spend a little time in the Maya Lifestyle Shopping Center at the junction of Nimmanhemin Road and Huay Kaew Road. The rooftop has an open-air atmosphere and several pleasant picks for a sunset drink. If you prefer to avoid the mall scene, check out the Kad Na Mor student night market near the university (just ask around for it). Arranged in an open-air shopping area, over 100 shops sell fashionable items at student prices. Cheap food and drinks are also available. 6 p.m.: The entire Nimmanhemin Road area north of campus is jammed with hipster joints, chic cafes, wine bars, boutique shops, and more. It's a hangout and hallowed grounds for students and "digital nomads" who live in Chiang Mai. Spend your last evening making friends with young locals who enjoy socializing with Westerners. They'll very much enjoy sharing their favorite spots in the neighborhood with you! 7:30 p.m.: Again, there's no shortage of interesting options for dinner nearby. Although the fusion eateries certainly are tempting, save the Western food for home. Instead, eat Northern Thai food while you can. Khun Mor and Tong Restaurant (Tong Tem Toh) are two popular options where you can enjoy sticky rice and regional specialties once more. 9 p.m.: If celebrating your last night is the plan, start at the Warm Up Cafe, one of the most popular spots in the neighborhood. It's a busy, social place with live bands, dance room, and garden. The Sangdee Gallery is a place to enjoy art, music, and drinks in a social setting. Beer Lab is, you guessed it, the place to go to sample a wide variety of beer from around the world — a good option if you're burned out on ​Thailand's usual beer choices.